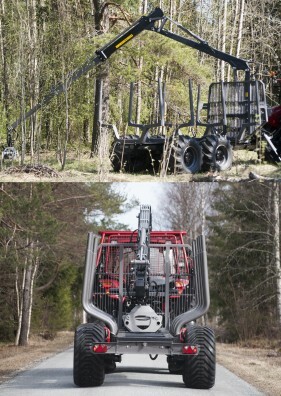 Riko will be launching our new range of professional forestry trailers & cranes at this years APF show. They are built by one of Europe’s top manufacturers and come with a market leading 3-year warranty. Trailers: Single beam and double beam chassis with maximum gross capacities of 8500Kg, 10,500Kg, 12,000Kg, 13,000Kg, 16,000Kg and 18,000Kg. They come complete with rocking beam axles, timber bolsters and headboard. Just a few of the numerous options include different tyres, air or hydraulic brakes, bed extensions, lights, steering drawbars, brash bodies etc. There are also models with 4-wheel drive. Cranes: With and without extensions, maximum reaches are 4.2, 5.4, 6.7, 7.0, 7.15, 8.0 & 8.5 meters. They come complete with grab, rotator and valve block. Just a few of the options include: conventional control valves with Joystick controls, servo operated mini joysticks inside the cab, full radio remote controls. Gull wing or ‘A’ legs, larger rotators, and larger grabs.